The TiVo Bolt integrates traditional cable and 4K streaming into a seamless, single system. It's lacking a bit in app variety, but if you're a serious TV enthusiast clinging on to cable, the Bolt is near unbeatable in what it offers. Update: The TiVo Bolt can now access Hulu directly through an app, and has recently partnered with the WWE Network to bring current, classic and live events to the digital video recorder. In the early aughts, TiVo pioneered a new technology called digital video recording (DVR) that captured the spirit of watching television. It freed entertainment from the shackles of time, and gave viewers the ability to watch content on their own terms. It would take nearly a decade for traditional cable operators to catch on and employ that technology in their own boxes, passing those development costs onto subscribers along the way. Then, when DVR finally went mainstream, the industry turned away from cable entirely, making all the work that those companies put into the DVR over the last few years moot. But the beauty of TiVo's new Bolt system is that it's more than a DVR or a 4K streaming video player, though it has those abilities as well. The Bolt is a truly next-level piece of tech that, through its intelligent software, aggregates shows from multiple sources like Netflix, Amazon and Vudu, as well as through an over-the-air HD antenna or mainstream cable subscription – should you own either of those. Put as succinctly as possible: the TiVo Bolt is your shows and movies, when you want them, where you want them. Most of us have anywhere between two and four black rectangular boxes sitting in our entertainment cabinet. They're usually perfectly flat, stack nicely and look like they were designed by the exact same engineer. 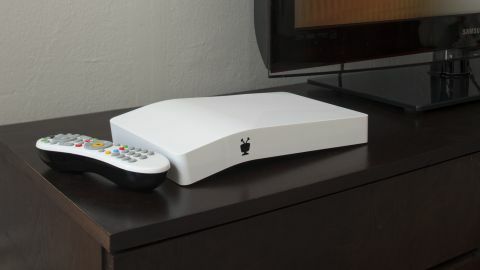 But instead of following in those footsteps, the TiVo Bolt has some pretty surprising design ideas, including a sloped top and an all-white shell that houses some seriously fast hardware. If you're looking for a size comparison to other DVRs, the TiVo Bolt is 33% smaller than TiVo's own Roamio and 65% smaller than the Roamio Plus and Pro. For non-TiVo owners, that translates to 11.4 x 7.3 x 1.8 inches (W x D x H), or roughly the size of a Sony PS4. The front, top and sides of the box are all smooth and, for the most part, completely blank. There's an indicator LED and a small TiVo logo on the front, but otherwise the Bolt is a brazenly blank slate. Spin it around to the back, and you'll find a Remote Finder button, cablecard slot, coax (Digital Cable, ATSC, MoCA) input, optical audio out, L/R audio, an HDMI 2.0a port for 24fps 4K or 60fps 1080p, a 10/100/1000 Mbps ethernet port, two USB 2.0 and an external storage port (eSATA). The big draws of the box itself are the external storage port (in case you decide to go for the smaller internal hard drive), and the equally fun and practical remote finder to help you track down your pad when it goes MIA. There are enough ports here to run an audio signal straight to your TV and soundbar or simply pass the signal through a receiver and let it do all the heavy audio lifting. Speaking of the remote, though, there's little to complain about regarding TiVo's pack-in controller. Most of the buttons will be familiar – you've surely seen a few dozen numerical pads in your life – but I found the thumbs-up and thumbs-down buttons a smart touch. Features on the TiVo Bolt are premium in both senses of the word. They are both exceptional in their execution in creating one of the best TV-watching experiences on the market, but these features also cost more than you might want to shell out for. Let's cover the cost first. A brand-new Bolt comes with one year of TIVo's service for free. Considering one year of TiVo service costs $149, that's a pretty solid deal. After the trial runs out, you can either switch to a monthly plan to the tune of $14.99 per month or opt in to the annual plan for $149 plus tax. So what does your investment net you? Access to services like OnePass, which intelligently scans the available channels and records any instance of a TV show or movie the next time it plays – without ever wasting space on duplicate content and prioritizing HD quality. If you've ever used universal search on a new Apple TV, Roku or Chromecast, TiVo also has a similar function, called Smart Search, that finds every source for the content you're interested in and lists them by price. It currently searches Fox, PBS, AMC, CBS, Showtime, Hulu, Netflix, Vudu, NBC, Bravo, FX, Comedy Central and Amazon – as well as cable or over-the-air signals – for the cheapest source of whatever you want to watch. But the creme-de-la-creme of TiVo features are SkipMode, which enables you to completely skip over commercials with the press of a button when watching recorded shows, and QuickMode, which speeds up a recorded show by 30% without raising the pitch of the characters' voices. They're both tremendously helpful to traditional TV watchers that either use cable or an over-the-air antenna, and will radically change the way you view traditional television. Thirty-minute shows will be reduced to roughly 20 minutes and hour-long epics can be compressed into roughly 40-minute blocks. You can watch three episodes of a show in the time it used to take you to watch two. For binge-watchers, like myself, that's well worth the cost of admission. The Bolt is an increasingly competent 4K video player, too. It can currently power its way through Netflix's Ultra-HD library without breaking a sweat, and TiVo says it plans on rolling out Amazon 4K support in the near future. Admittedly, the TiVo Bolt doesn't have the same massive Ultra-HD library as, say, the Roku 4 has right out of the gate, but it's clear that the groundwork is in place to get it there. The biggest fault of the system is that, when it's compared to the other streaming video systems out there – game systems like PS4 and Xbox One, Amazon Fire TV, Apple TV and Roku – the TiVo comes in a little light on apps. The TiVo Bolt is an unbridled binge-watching machine. It collects the shows you want to watch in an insanely easy-to-navigate interface and, through the beauty of OnePass, intelligently organizes your carefully managed recordings. Of course, once you do record a show, you'll be able to watch it faster, thanks to features like SkipMode and QuickMode. This means you'll spend more time enjoying your shows and less carefully fast-forwarding through commercial breaks. Setting up additional storage is simple, as is connecting it to a nearby HTPC for Plex. Finally, TiVo is finally boarding the 4K bandwagon to some surprising results. It tore through Netflix in Ultra-HD, and the company has plans to take on Amazon's 4K catalog in the coming months. The TiVo Bolt is definitely lacking when it comes to crucial video streaming apps. While it has Vudu, Amazon and Netflix, it's missing key services, like Showtime Anytime and HBO Now, that would allow cable reductionists to only pay for an antenna and then stream premium content through the apps instead of a paid cable package. Additionally, the TiVo Bolt box comes part and parcel with the monthly service. You'll get the first year of service free when you purchase your system. But payments to the tune of $150 a year, once the free period ends, makes this a tough sell for those looking to save money by cutting the cord. The TiVo Bolt does an admirable job in everything it sets out to do. Not only does it perform as one of the best DVRs on the planet by allowing you to record up to four shows at once, but it completely organizes them in one of the most easy-to-use interfaces. Plus, new features, like SkipMode and QuickMode, will make it so you don't waste hours of your life watching ads that you don't care about. On top of all that, the Bolt is a competent 4K streaming device, tackling Netflix's Ultra-HD library at launch and setting a course for Amazon's offerings next. It could use a few more apps, like HBO Now and Showtime Anytime, to round out the options for cable cutters trying to scale back their cable bill. One problem it can't shake is the monthly fee, though a one-year-free trial helps make the Bolt's $299 and $399 price tag a little more wallet-friendly. If you plan on cutting the cord completely, check out the excellent Roku 4. It lacks a cablecard slot, but offers thousands of channels of streaming content of its own. But ultimately, the Bolt is at the top of the table for TiVo, and it's easily one of the must-own products in the home entertainment category for anyone planning on sticking with cable.